Happy 2014 from the Fellowship of Isis Homepage Archive! "We move towards the North, to the window of Capricorn. It is mighty and vivid with colors that seem to be alive. Above the window is the sign of Capricorn. We see a stained-glass picture of a goat, with fish's tail, accompanied by a green man crowned with leaves, and a mermaid holding a cornucopia - every sort of good thing, fruit and wheat. We like the green man too, with his comical expression, his golden halo and his antlers and his leaves. However, suddenly the wind blows the window open and we face the actual constellation of Capricorn in its spiritual form.. . 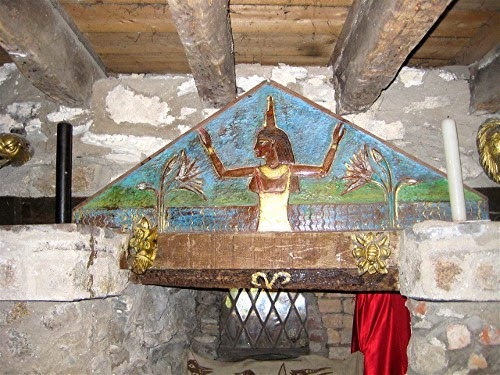 The Magi of old called Capricorn "Altera Solis Porta", the starry gateway for souls to enter heaven. Here we gaze at the stars and hope for a vision of the Earth Goddess, who is our Goddess of the Earth, Nerthus. For we know that She is crowned with the stars, holds the earth in her hands and has the moon on Her brow and the sun as a robe. We accept the gifts of earth - trees and flowers and animals and birds. 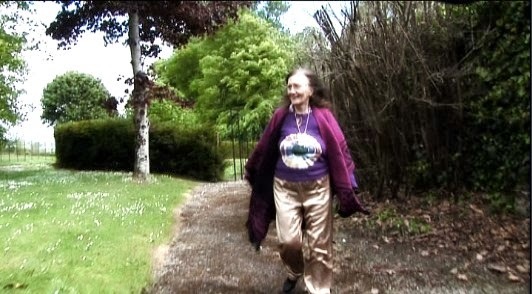 We adore Her and She is in all beings, as is Her green Consort. We are whole. May the blessings of the Goddess Nerthus bring you wisdom and peace, now and forever." "The garden is counted to be the second oldest garden in Ireland. The terraces were laid out by Alexander (ii) Durdin in about 1860. Much of the wilderness was tilled, for root crops. The terraces were dug down about 4 feet and the bank removed by the Rev. 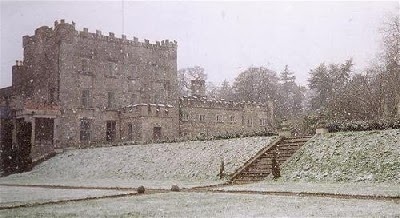 Lawrence Durdin-Robertson, who also filled in the path on the southeast side of the Castle and the path running from the house to the centre walk." Quote from the booklet "Clonegal Castle," by Lawrence Durdin-Robertson. 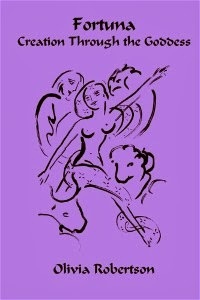 "The rites in this book are dedicated to the Goddess of Fate, Fortuna. They involve a three-fold woven plait derived from alchemy, myth and astrology. Each begins with an Oracle that presents the Theme. A Candidate who is represented in each Rite declares the Magical Intention. A succession of cards from the Marseille deck have to be interpreted during the twelve Rites, to give the Candidate a symbolic key. During the initiatory journey, the Candidate is faced with the robed Goddess of Wisdom, Themis, holding the scroll of Sybilline prophecies. During succeeding Rites, the Conjuror teaches control of the four elements of consciousness. 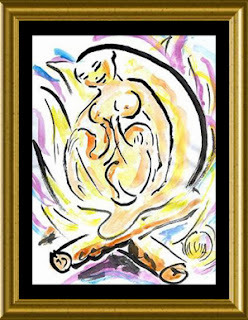 The raising of the serpent Fire of Life within is demonstrated by La Force, a woman with lion emerging from her body. When the Candidate has ritually undergone the five-fold Initiation of hanging, death, the Angel, the Devil, Heavenly Lightning and The Judgement, the lunar, solar and starry spheres are experienced, culminating in a vision of the Cosmic Goddess of the Zodiac. Themis removes her veil and reveals herself as the naked Fortuna surrounded by the four Guardians of the zodiac. During each Rite, having interpreted Tarot symbolism, the Candidate is offered a Mystery drama, drawn from world mythology. Related to present-day events, the Candidate is introduced to the tragic King Oedipus as a modern atomic physicist. The cursed Ring of Norse myth represents a circle of volcanic eruptions: the antediluvian Cesara's ark becomes a modern seed-gathering spaceship. The third strand of this plait involves a series of magical journeys through the twelve zodiacal houses. 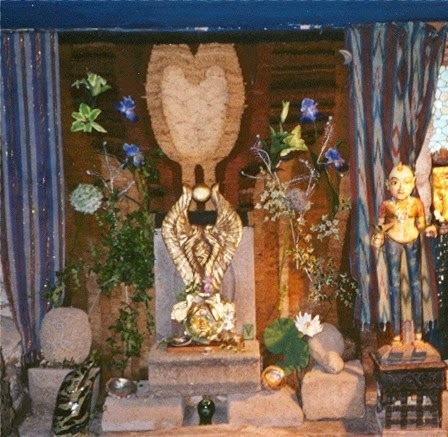 The Temple of the Zodiac is visualised as etheric, and therefore nearest to our physical world. 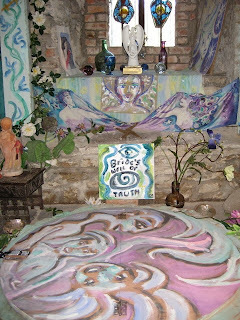 Through this Temple the Candidate experiences psychic, spiritual and divine spheres. Thus the macrocosm is revealed through creative imagination as the source of the microcosm. The incomprehensible magnificence of the stars offers infinite possibilities for our own gift of creation. 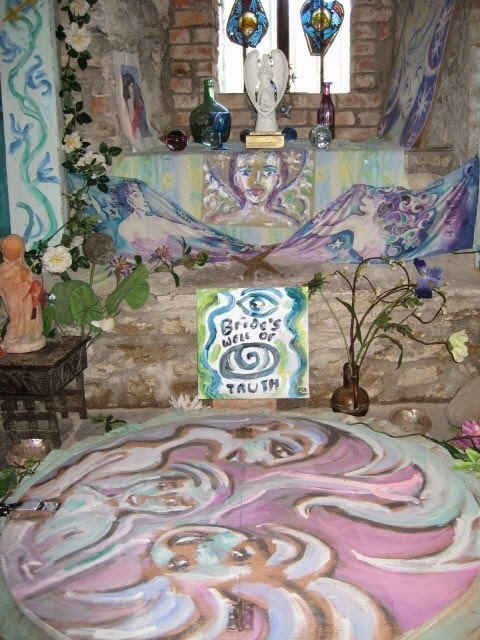 Time and place become fluid, material for the cosmic artist, co-creating with the Deities. Even the physical earth can be changed for good. This realisation brings the candidate back to earthly tasks. A child's drawing of a tiger calls on us all to preserve tigers from extinction. A dream of an Arcadian tree reminds us to protect rain forests. Inspired by the Goddess of Fate, we know what to do." 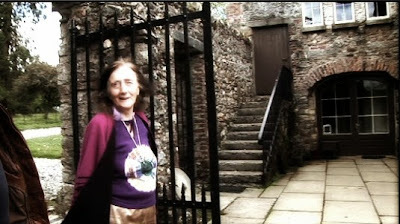 Olivia Robertson at the Castle gate. This is a still photo from the previously posted dvd clip. Our thanks to Dennis Murphy of Logic Reality for sharing this. 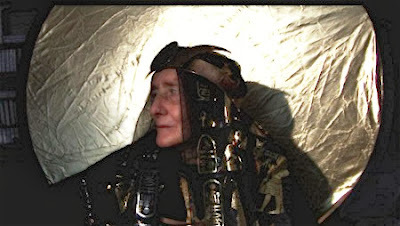 Our thanks to the producers of Olivia Robertson's DVD, Olivia, Priestess of Isis, for sharing this new video clip. Dennis Murphy and Steven Jones write: "This was the last time we filmed dear Olivia. The last look through the temple window."